Jamie Facer-Childs and James Thysse are currently undertaking one of the world's toughest challenges, rowing over 3,600 miles across the Indian Ocean - an epic adventure that takes them from one continent to another - Australia to Africa! "Our challenge is to raise money and awareness for two important charities, 'Headway' and 'Sparks' and at 21 and 22 we are rowing to set a new world record as the youngest ocean rowing pair in history." Meet James and Jamie at the airport! James and Jamie are arriving back in the UK on Flight BA122 arriving at Heathrow Terminal 5 at 18.40 Saturday 15th August. Anyone who would like to be there is welcome. We are also looking for a measure that would give them the record for the most optimistic team to have crossed an Ocean but that will be somewhat harder to prove. 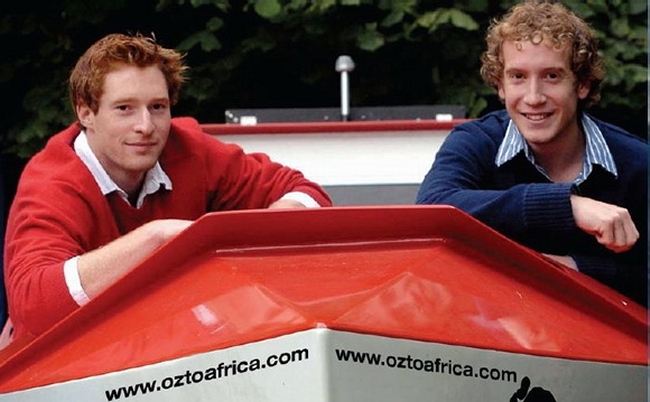 July 31st 2009 at 111GMT saw Jamie Facer-Childs and James Thysse became the youngest team ever to cross an ocean entirely under their own power. The pair were a 21 and a 22 year old at the start but after 103 days, 9 hours and 26 minutes and a birthday celebration in mid-ocean they both finished as 22 year olds. The time in-between involved rowing 3600 miles across the Indian Ocean (from Geralton in Australia to Grand Bay in Mauritius). Initially the pair hoped to cross in about 60-80 days but, amidst some of the worst storms in many years, they were delayed by winds, waves and currents that insisted on pushing them back to Australia. More than half the boats that set off failed to complete the journey. All the more credit, therefore, to this young pair who showed courage, determination, resilience and ingenuity as they struggled with the practical (repairing boat parts, solar panels, electrical failures, broken oars etc), the physical (sores, ulcers, sea sickness, claw hands, bruises etc. ), the emotional (rowing for 17 hours at one stretch attempting to get out of a bad current only to find they had gone backwards) and the mental (what am I doing here!?). Arriving in Mauritius they were greeted by a jubilant (and noisy) crowd of supporters and admirers. The sun was setting as they rowed those last few miles beyond the finishing line (which gave them second place in the pairs class race) to also give them the youngest land-to-land record. It is also believed that they are the lightest team to complete the crossing - having weighed in at 84 and 80 Kg at the start of the race (reducing to 71 and 69 at the end). The image of rowers needing to be beefy and 6 feet plus has been challenged by the relatively small stature of this pair. As they rowed those last few miles the wind had finally dropped allowing them to enter the bay amidst fireworks and flares. Imagine the mix of emotions as you accomplish your goal, as you re-enter the world of people, where the sound of voices replaces that of the wind and waves that have been your constant companion for 103 days. And how do you readjust? The pair were in remarkably good physical shape given that they had existed on 2000 calories per day for the past few weeks (their rations had been damaged in a capsize half way across). Even more remarkable was their good spirits. On the outside they had changed - thinner, hairier and weathered. However, the biggest change is on the inside - and that will take longer to be disclosed as it unfolds and shows itself in the lives of these boys - who have passed their rite of passage and are very clearly now young men. J and J need your donations! Many of you visiting this site will already have made donations or helped James and Jamie's cause in one way or another. But that was before we all realised just what fantastic lads they are. They have now completed their epic journey, and in doing do, they have survived a capsize trapped in their cabin upside down under the sea for 7 minutes - they have battled with waves higher than three houses - they have narrowly escaped being sent to oblivion by a huge ocean-going tanker passing in the night - and have spent the last 6 weeks on half-rations or less due to the food they lost during the capsize. If they are going to make their targets for their charities, they really need your help right now. Click here now to make a donation via PayPal or credit card. Feel free to navigate through our pages and links, find out more and support us in our endeavour.